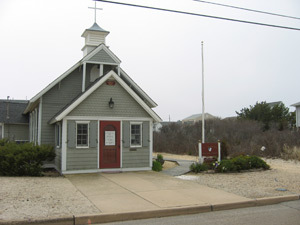 This little church on 3rd Avenue in Ortley Beach is believed to be the oldest standing structure in Ortley. The building was originally built for Mrs. T. Robinson Warren in 1885. This New Brunswick, NJ native wanted to offer thanks for her daughter Cornelia’s return to good health. The church was her expression of gratitude. The family later turned the building over to the New Jersey Episcopal Diocese in 1916. Much of the interior remains in its original state, although the outside has been changed somewhat. One big disaster the chapel narrowly escaped was a 1922 fire. This blaze started at the railroad tracks and quickly spread. It burned the 2nd Ave Victorian hotel, several cottages and the chapel. Fireman were able to limit the damage to the roof of building. Another near miss occured during the 1962 noreaster that damaged buildings up and down the New Jersey coast. Two summer homes adjacent to the chapel were washed away during that storm. Saint Elizabeth’s holds services at different times, depending on the time of the year. You can find out what their current schedule is at their website.